Under the direction of newly-appointed head coach Aaron Kincaid, the volleyball team (9-11) hopes to end their longtime losing streak against the Helias Crusaders tonight at home. Recognized as one of RBHS’s most resilient competitors, Helias (16-2) is ranked as the third best team in Missouri. For years, RBHS has been dealing with tough losses when facing the Crusaders’ athletic, fast-paced and intensely aggressive style of play. In last season’s matchup RBHS was kept to 12 points in the first set and 14 in the second by the Crusaders, who won the game 2-0. “Helias is traditionally one of our tougher competitors, so it will be a lot of preparation on our part,” Kincaid said. Because of the Crusaders’ robust nature, Kincaid believes the best strategy to use against them will be a very quick and deceptive style of play. 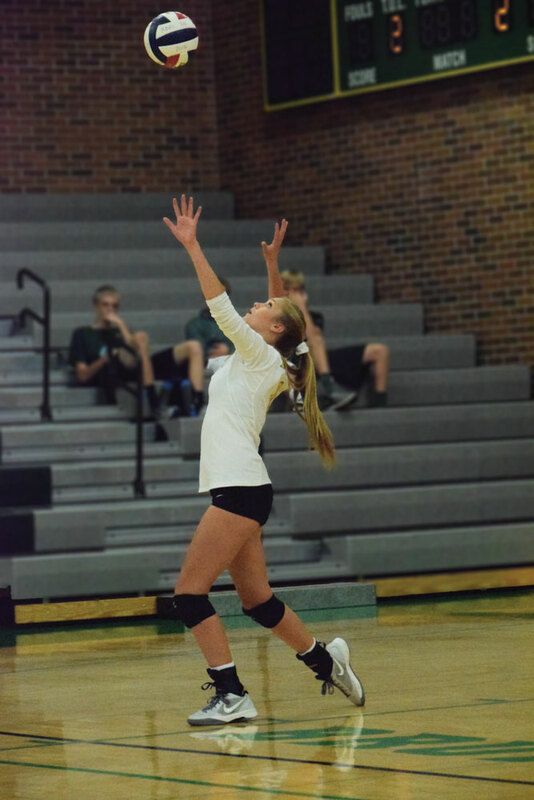 Outside hitter Madison Cleeton said that maintaining efficient team chemistry throughout the game will serve as another effective way in keeping up with their opposition. “I think the most important strategy is just to play strong mentally,” Cleeton, a junior, said. “Staying up and being positive with one another can definitely turn a game around. Despite the tough match ahead for RBHS, defensive specialist junior Macy Knorr remains confident in the team’s ability. The game will kickoff at 6 p.m. in the RBHS Main Gym tonight, Sept. 22. Tickets will be for sale at the door or students can use their activity pass. How do you think the team will fare against Helias? Comment below and let us know!